Lasagna is probably the most loved family meal of all time. And your family probably have a recipe for making them. Making the perfect lasagna requires skill and having the right ingredients. Skills are either learned through experience or you simply have the knack for it. The most common ingredients you use are pasta noodles, meat and sauces. You can choose beef, chicken, pork, or a combination of the three. 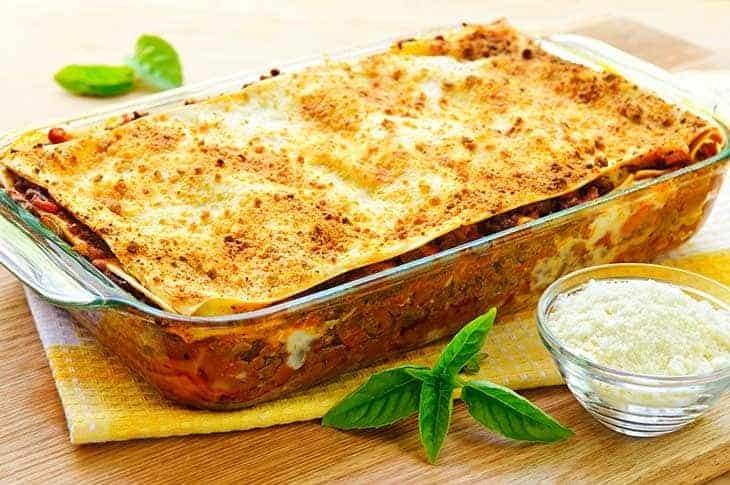 How you prepare the ingredients will also greatly influence the outcome of your baked lasagna. The sauce will require cheese such as mozzarella. But you can use béchamel or ragu too if prefered. The vegetables you can add are mushroom or spinach. You need to also have the ﻿right kitchen tools to cook the lasagna with. And the most important tool is probably the Lasagna pan. Surprisingly, there are several kinds, each with its own advantage and disadvantages. This 14-inch stainless pan will fit in most standard sized ovens. It’s ideal for your lasagna since the stainless interior does not react with the food. This will retain the flavor and tastiness of your lasagna. The stainless finish on both the interior and exterior presents a professional look for your lasagna. The pan has side handles to make it easier for you putting it in and out of the oven.This Cuisinart lasagna pan is not recommended for induction stoves. It needs flames or electric current rather than magnetic energy for the quick heat. You have to keep in mind that this pan is designed to heat up quickly but keep hot only with minimal heat settings. Another disadvantage for this brand is the difficulty of washing it after use. Leftovers get stuck and it takes some effort remove it from the pan’s surface. There are also issues with the side handles which were riveted to the pan. There is a likelihood that one or several rivets can fall out after several times of use. This is probably the result of normal wear and tear. Does not have any metallic taste. This brand is not induction ready. Users of this non-stick lasagna pan swear that it has just the right thickness and size for crepes. 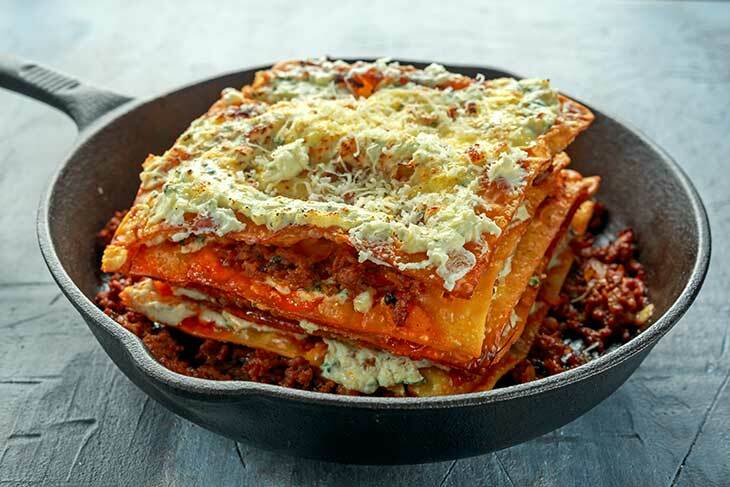 The pan is also suitable for multi-layered lasagna. You will have no problem putting it in most standard ovens with its two side handles. Its non-stick property is due to hard anodized construction. Despite its appearance, the pan is PFOA free which means it’s safe for handling food.Unfortunately, there are some complaints about the quality of this non-stick hard anodized lasagna pan. The pan’s bottom does not sit well with the stove which is probable cause of the dents. But such criticism has yet to be confirmed by an impartial test. Others complain that the pan starts to lose its non-stick layer after only two months. Still a number of users reported that chips began appearing while using the pan to bake lasagna. The rivets in the side handles can fall out due to normal wear and tear. Some users were disappointed after noting that several chips began to appear after using it for a few times. This is a not your typical lasagna pan. It has three separate channels that can fit not only lasagna noodles but also pastries such as bread and cakes. The multi-channeled pan is coated with non-stick materials. The makers claimed that the pan is dishwasher safe. But they concede that hand-washing is still the best way to clean it. It also has a lifetime albeit, limited lifetime warranty.The main criticism against this 3 channel pan is inability to fit the standard-sized lasagna noodles in any of the three channels. The side handle also is not what you would expect. You should also keep in mind that this pan is not suitable boilers. Some users who put the pan inside the dishwasher later regretted that decision. It seems the only way to clean this pan is through gentle hand washing. You can fit 3 kinds of recipes in just one pan. There are some complaints about how the standard sized lasagna noodle won’t fit in any of the pan’s channels. The side handle is not what some people would expect. 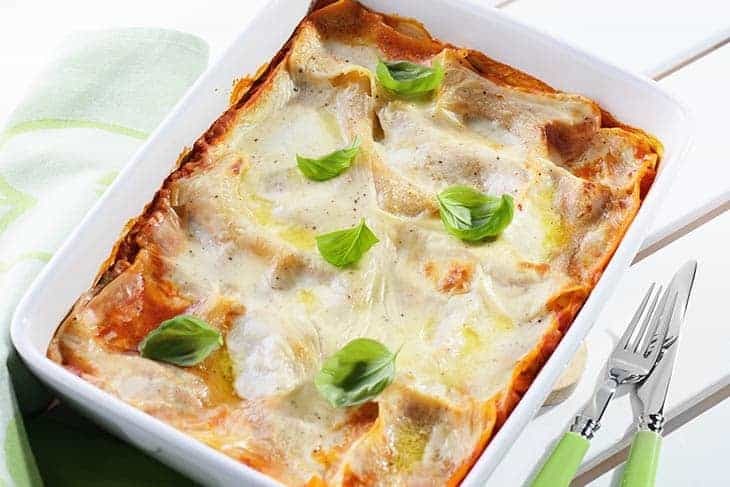 This porcelain lasagna pan can work well in extreme hot and cold temperatures such oven, boiler, microwave, and freezers. Users note the uniform distribution of heat. It’s deep enough to make layered recipes of your favorite lasagna or mac and cheese. The porcelain material prevents the transfer colors, flavors, and even odors between uses. The porcelain pan has its some shortcomings, like having uneven sides, according to some users. Since this pan is made of porcelain, it’s more prone to breaking and cracks compared to a metal one. The pan is does not have side handles and does not fit all ovens. Duralex is a French-made glass lasagna pan. The tempered glass can withstand temperatures between -4 Fahrenheit and 572 Fahrenheit. This makes Duralex safe for use in ovens or freezers. The glass pan is twice as strong as ordinary glass making it resistant from impacts or chips. You could stack it and save on storage space. The glass is also nonporous and does not absorb any liquids. Users will also have no problem using the dishwasher to clean the Duralex glass pan. Unfortunately, despite its notable qualities, this glass pan has a major drawback. You need to make sure not to drop it since the glass pan can shatter or gets broken. Risk of breakage is high. 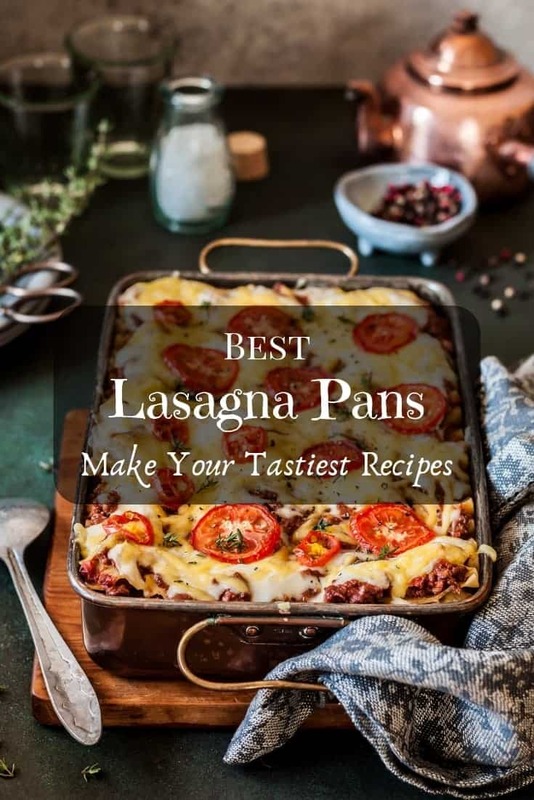 Best lasagna pans to make your tastiest #recipes! Stock up your #kitchen with the best. 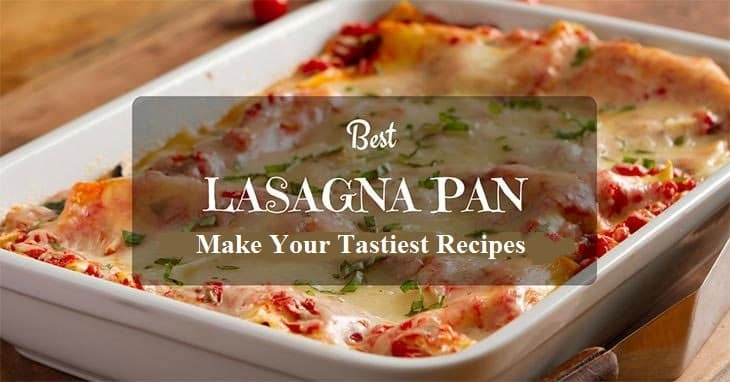 I learn from the experience of others in deciding which lasagna pan is suited for my cooking style and recipes. But there are different kinds of pans out there in the market. Here is a quick guide that can help you choose the suitable one for you. It required a lot of research but it’s worth it. Here are some of the factors I considered in choosing the lasagna pan. 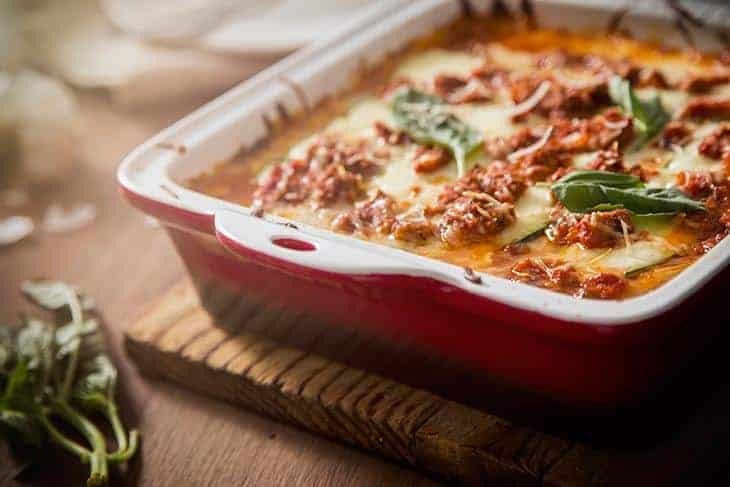 Lasagna pans made of glass or ceramic can give you the best baked lasagna due to its ability to heat the food gradually. Once out of the oven, the food stays warm for a long time. It also does not have that “metal taste”. You also don’t have to worry about the kind of spatula you use since its inner surface is not easily scratched. A lot of people prefer stainless steel because probably because of its glossy appearance. It’s normally rust-resistant and scratch-proof. Unfortunately, it’s not a good heat conductor. The lasagna will heat up quickly once inside the oven. But will get cold just as fast once it’s taken out of the oven. You should avoid using this kind of pan if you’re going to include acidic food. The reaction can cause your food to have that “metal taste”. The material is a combination of carbon and steel. The result produces a pan that it’s scratch and deformation resistant. You will have no problem using it on the grill, convection oven or stove. The pan is a combination of cast iron and stainless steel. 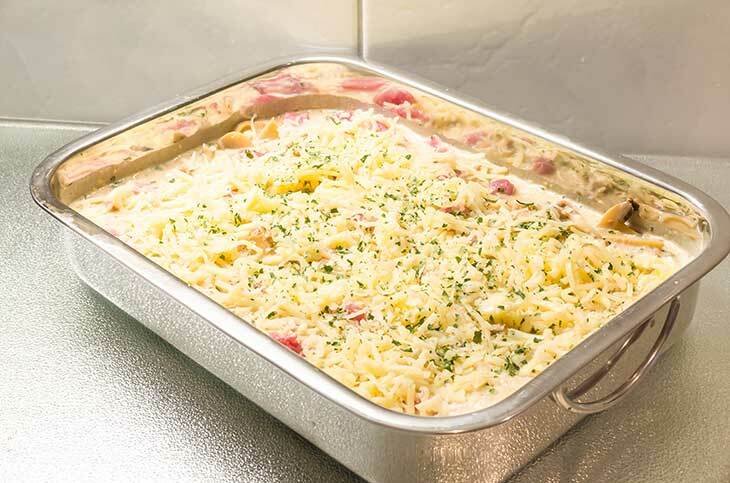 This kind of lasagna pan is normally coated with a non-stick material to prevent the food from sticking. Aside from the materials mentioned, there are other pans out there that are made of aluminum, copper, and silicone. But the pans made of glass, ceramic, stainless steel, cast iron, and carbon steel are the most popular choices. Lasagna pans come in a variety of sizes. But people usually prefer the ones that are two and a half and three inches deep. This makes sense since I can put more layers of pasta, meat, and cheese on the pan. We can consider the two and a half inches pan as the regular size while the three inches as the “deep” type. Each of these lasagna pans has its own shortcomings. But I will agree with a lot of people and chose the Cuisi﻿﻿na﻿﻿rt Lasagna Pa﻿﻿n with Stainless Roasting Rack. The pan does have some flaws but its advantages far outweigh them. The glossy interior and exterior and its ability to fit in most standard size oven is its major advantage. The affordable price and the roasting rack are additional incentives for you to get this brand. 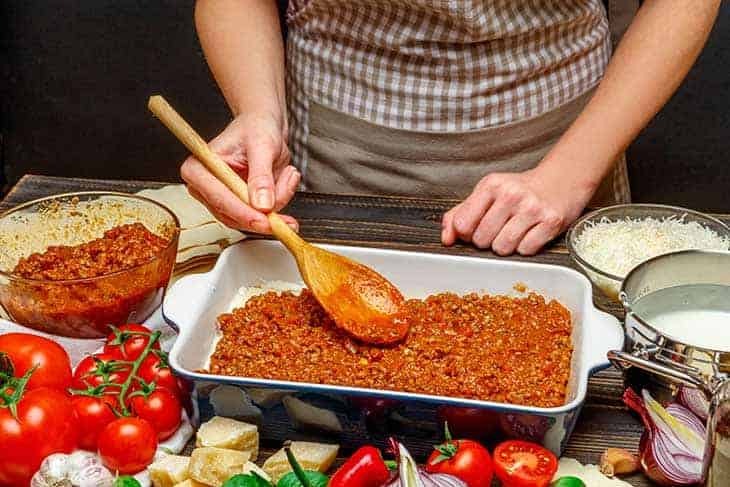 Ultimately, the best lasagna pan is the one most suited for your baking and cooking needs. If you have used the products I have mentioned above or you have any suggestions, please feel free to leave some comments. We would love to hear from you.